An impressive test with a striking elegance and sophistication in pretending 3 dimensions. The joystick helps to assess the sensomotor coordination precisely. 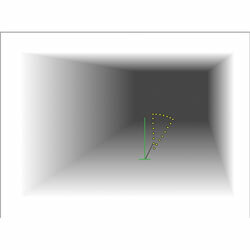 This test assesses the coordination of eye-hand, hand-hand, or eyehand-foot by maneuvering a circular segment that moves on its own about a 3-dimensional room. Main areas of application: performance-oriented aptitude diagnostics (especially for railway engine drivers, crane drivers etc., as well as for personnel of controlling and observation activities), traffic psychology, aviation psychology, medicine, and clinical psychology (assessment of coordinative deficits in clinical groups). The assumption is that movements are controlled through the use of sensor information coming from current activities. Occurring deviations between target value and actual value are revealed and corrected accordingly (the TOTE principle). The necessary time to coordinate one's movements is essentially determined by the received and processed feedback information. Two completely separate constructs are assessed: the "Anticipative coordination ability" refers to sensomotor coordination necessary to maneuver an element to a pre- set goal (target is known beforehand). The "Reactive coordination ability" refers to sensomotor coordination necessary to react adequately to an element's spontaneous, unpredictable changes of direction (and size) (ability to anticipate movements). The element selected for this test is a geometrical shape (circular segment) that is easy to describe and is hardly influenced by any previous experiences. The screen depicts a room with a target position (green bars forming an upside-down "T") and a maneuverable element (yellow circular segment). The circular segment starts moving about the room in unpredictable directions (that remain the same for all respondents). All test forms include a preceding instruction and practice phase. S4: Special form for foot pedals (10 minutes). The following seven variables are assessed: "Time in ideal range", Mean and distribution of "Angle deviation", "Horizontal deviation", and "Vertical deviation". The internal consistency is situated above r=.90 in all scales. The results of statistical correlation analyses and inter-group comparisons (including other tests and various external criteria) back up the convergent and discriminant validity of the SMK. Extensive aviation psychological validations (pilot selection) have been conducted with the Austrian Federal Army. Test forms S1-S3 are provided with age- and education-specific samples (N=239). Test form S4 can be compared to age-, gender-, and education- specific samples (N=189).